In Rise of the Whirlwind, Born of Blood, the image of the Samurai warrior is meant to give feeling to what the G.I.s faced in the fanaticism and suicides of the Japanese in Saipan. 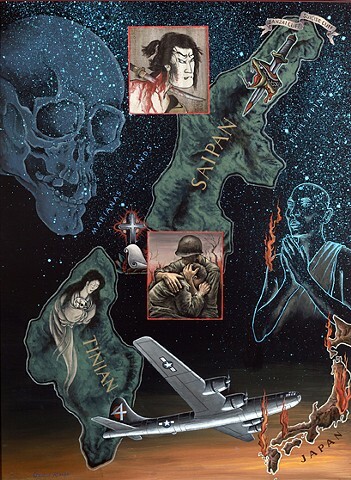 After the blood bath of Saipan, the stage was set for Tinian to send a whirlwind of fire and destruction against the Japanese from its newly build B-29 air bases. On July, 1945, the USS Indianapolis dropped anchor in the Bay of Tinian and delivered components for the atomic bomb. In the night sky, a Buddhist monk faces the coming fire.